When I started studying hemispheric dominance back in the early 1970s, the phenomenon was just barely recognized as a science, and even at that there was much more to be learned as the concept was studied by both the medical and psy-chological professions of the time. At the time, speaking of someone as being "right-brained" might easily be mistaken by many as the opposite of "wrong-brained." At the time, it was assumed by many laymen that all artists were mostly right-brained. Since then, such "cut and dried" assumptions on the subject have proven to be oversimplified, at best. and quite false in some cases. More recent studies have shown that hem-ispheric dominance among artists tends to be about the same as that of the general population, except that they tend toward the (whole-brained) center of the spectrum a little more. As with many such topics, studying those who are "average" is far less interesting than looking at those on the outer limits of the bell curve. That's especially true of highly dominant right or left-brained artists. The work of the right-brained artist tends toward Expressionism and abstraction. The work of the heavily left-brained artist tends to be hard-edged and very often architectonic in nature, though abstraction along these lines is not unknown. 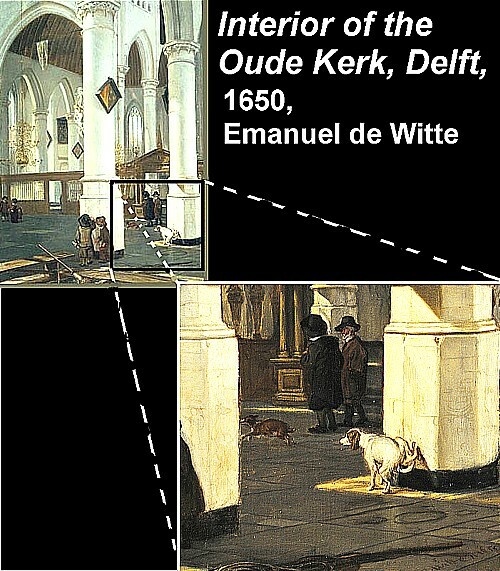 With that in mind, we can safely assume that the Dutch painter, Emanuel de Witte was very left-brained. Until quite recently, architectural art involved an in-depth understanding of linear perspective. Today, with the advent of curvilinear architecture, that's not so much the case. At any rate, during the 17th-century Dutch "Golden Age" that was the case and there was a distinctly specialized type of art sometimes referred to as "perspective painting." Over the cen-turies, such artists as Eduard Gaer-tner, Vincenzo Chilone, Jacobus Fer-dinandus Saey, Domenico degli Am-brogi, and others have come under this label. In virtually every such listing, the work of Emanuel de Witte heads the list. And if you've never heard of any of the aforementioned painters, that's probably because Perspective Art seldom falls under the heading of anyone's "favorite" type of painting. I mean, you can marvel at the virtuosity and photographic accuracy of de Witte's soaring Gothic architecture, and admire his propensity toward exacting details, but after the first two or three you begin to realize that if you've seen even one of his immense empty churches, you've pretty much seen them all. 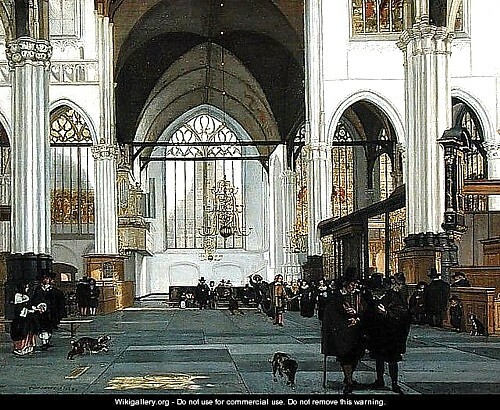 However, de Witte's rendering of the Interior of the Nieuwe Kerk, Delft (above, right), from 1656, is more vibrant and colorful than most. 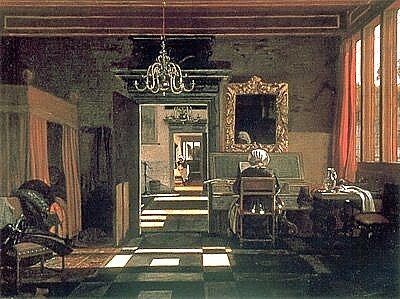 Emanuel De Witte was born in 1617 near Alkmaar (central Netherlands). He learned geometry from his father, a schoolmaster. Whereupon he joined the local Guild of St Luke in 1636 at the age of nineteen. After a stay in Rotterdam, he moved to Delft where he studied under Evert van Aelst. 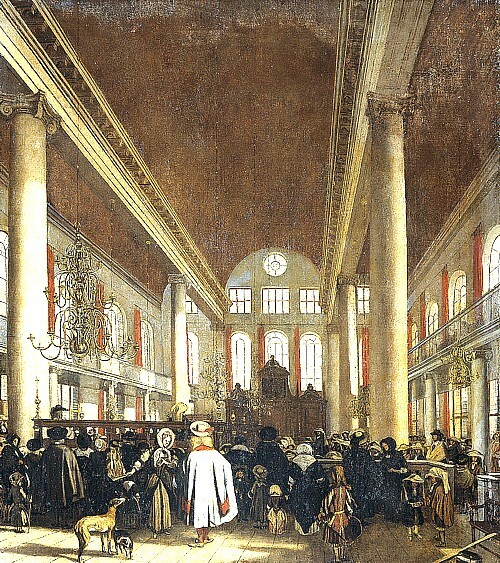 Around 1651 de Witte settled in Amsterdam where his first wife, died in 1655. He then married a 23-year-old orphan, Lysbeth van der Plas, who turned out to be a bad influence on de Witte's adolescent daughter. In 1659 both were arrested for theft from a neighbor. Lysbeth, who was pregnant at the time, had to leave the city for a period of six years. She was forced to live outside the city walls where she died in 1663. 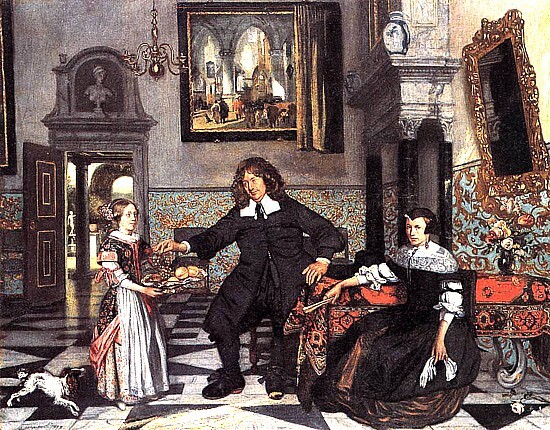 Portrait of a Family in an Interior (above) is one of de Witte's few genre interiors and may represent an idealization of Dutch family life he could only wish for. 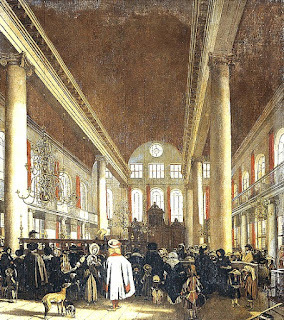 In the years after the arrest of his wife and child, de Witte was forced to indenture himself to the Amsterdam art dealer Joris de Wijs, thereby surrendering all of his work in exchange for room, board, and a stipend of 800 guilders annually. Eventually, de Witte broke the contract, and was sued by the dealer, forcing him to indenture himself still longer. 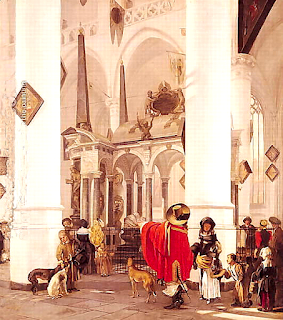 Even though several patrons bought de Witte's work, the man was no pleasure to be around. He would often shout at his clients and at people watching him as he worked painting his churches. He also had a bad gambling habit. 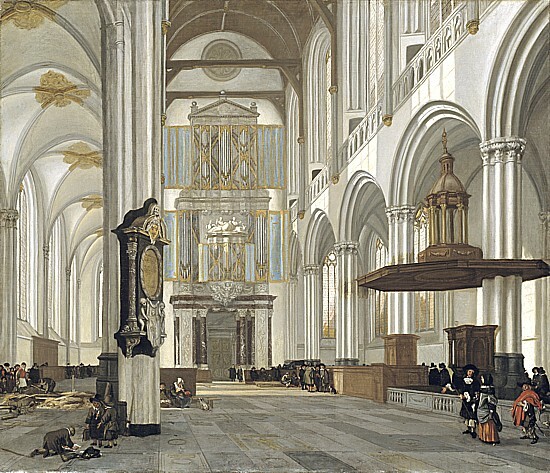 Around 1688 he moved in with a student, Hendrick van Streeck, in exchange for teaching him to paint church interiors. After an argument about the rent, de Witte hanged himself from a canal bridge in 1692. His suicide attempt was not initially successful, until the rope broke and de Witte drowned. Because the canal froze that night, his body was not found until eleven weeks later. Interior of the Oude Kerk, Delft, 1650, Emanuel de Witte.